To hear Attorney General William Barr tell it, Special Counsel Robert Mueller didn't find a smoking gun that showed President Donald Trump obstructed justice. To hear Trump tell it, Mueller's report represented a "complete and total" exoneration. But to hear Mueller tell it, there are at least 10 instances of the U.S. president trying to head off or undermine his Russia meddling investigation that could justify congressional action. The public heard directly from Mueller for the first time today, when most of the findings of his 22-month probe were unveiled. While Mueller didn't find an "underlying crime" by Trump related to Russian interference in the 2016 election, he said acts of possible obstruction include "discouragement of cooperation with the government and suggestions of possible future pardons." The 448-page report cited Trump's firing of FBI Director James Comey and efforts to have former Attorney General Jeff Sessions take control of the investigation. 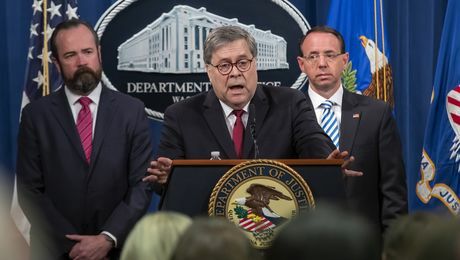 Democrats, who have accused Barr of trying to protect Trump by releasing just a four-page summary of the report more than three weeks ago, were quick to argue that Mueller's damning assessment was at odds with the public statements by Barr and Trump. They're likely to pursue their own investigations with fresh vigor. But, with polls still indicating that much of the public doesn't view the probe as a key campaign issue, traction could be elusive. "It's a report he did for me as the attorney general," Barr said when asked why Mueller didn't appear with him at today's press conference. Click here for a list of top takeaways from the report. "I'm f---ed" | Trump's outward confidence about the Mueller probe belied an initial fear that it would destroy his presidency. "Oh my God," Trump said upon learning of Mueller's May 2017 appointment. According to notes taken by Assistant Attorney General Jody Hunt and incorporated into the report, Trump slumped in his chair, adding, "This is terrible. This is the end of my presidency. I'm f---ed." Desperately seeking Mueller | Democrats are keen to put the special counsel in the witness chair and question him directly. 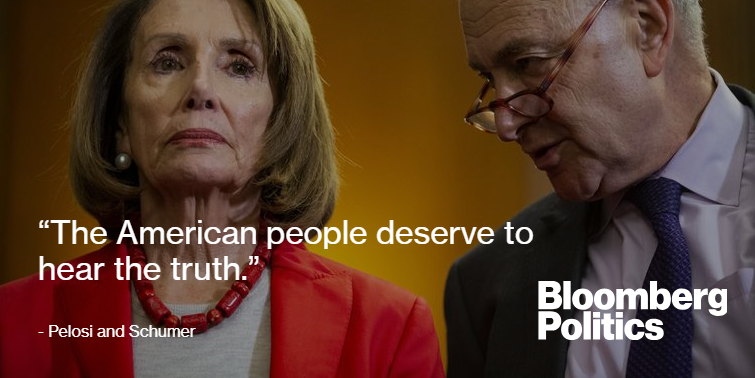 House Speaker Nancy Pelosi and Senate Minority Leader Chuck Schumer called for Mueller to testify on Capitol Hill "as soon as possible," saying it's needed to restore public trust after Barr's "regrettably partisan" handling of the matter. The chairmen of the House Intelligence and Judiciary committees have requested that Mueller appear before them in May. Escape clause | Trump dodged a subpoena forcing him to testify – despite offering only written answers that the special counsel determined to be "inadequate" – because Mueller's office was wary of the "substantial delay" a legal battle would cause. Mueller's decision to forgo a fight to compel the president's testimony may be one of Trump's biggest victories in the matter. From Kushner, with love | Among the report's revelations: A friend of Jared Kushner worked with a deputy of President Vladimir Putin to develop a U.S-Russia "reconciliation plan." Mueller claims that Kushner – the president's son-in-law and senior adviser – received a copy of the proposal after the 2016 election, giving it to Trump's chief strategist at the time, Stephen Bannon, and then-incoming Secretary of State Rex Tillerson. And finally...The winter of Trump's Mueller discontent might not be quite over, but that's not stopping him from declaring it so. 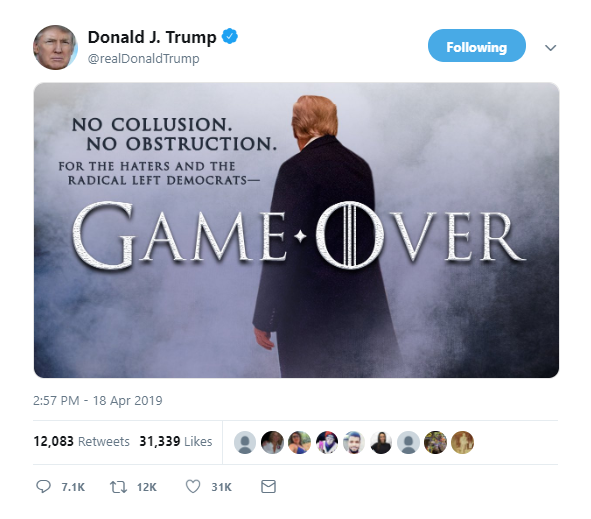 The president again employed a "Game of Thrones" meme to drive home a point, tweeting "Game Over" at the conclusion of Barr's press conference. Trump caused a stir in November by warning that "Sanctions are Coming" after announcing his plans to increase penalties on Iran, prompting HBO, which airs the hit series, to release a statement saying it would "prefer our trademark not be misappropriated for political purposes." You received this message because you are subscribed to the Bloomberg Politics newsletter Balance of Power. You can tell your friends to sign up here. هذا هو اللاعب الذي يحلم يوفنتوس بضمه - تعرف في هذا الفيديو، على اللاعب الذي يحلم يوفنتوس بضمه. إصابة 32 شرطيا ومشجعَين في أعمال شغب في مباراة بالدوري المغربي - أسفرت أحداث شغب شهدتها مباراة في الدوري المغربي لكرة القدم عن إصابة 32 عنصرا من قوات الأمن ومشجعَين اثنين. Obama-Era Border Chief Warns: Migrant Crisis "Worst in History of Country"